“The moonlight from the movie screen reflects on the graffiti-covered walls, the video shifts to the view from a lunar rover driving on the surface of the moon, and a monotonous voice traveling from far away, as if from an interstellar radio, gives out the instructions for a lunar landing. “Altitude, velocity, … twenty feet, fifteen feet forward, … four and a half down, five and a half down …”, until the transmission breaks off. Amidst the accumulated dust, a tense tranquility permeates this moonlit scenery, a strangely peaceful atmosphere created by looking at an ocean of discarded objects. Navigating this tide of garbage recalls Stanislaw Lem’s Solaris; very much like the omniscient sea in the novel, this landscape is a living organism that conjures up past lives and better days.” (see full text below). Garibaldi Plaza is one of the most intense places in Mexico City. This is not a statement to be taken lightly. It is a 24-hour, 365-day vortex of sound and vision, where Mariachis congregate and ensembles of Rancheros, Trios, Huastecos and Norteños, big and small, play loudly, nonstop and all at once. Cantinas and nightclubs surround the vast rectangular square where all sorts of tourists and locals converge together to drink and listen. They circle around from band to band and bar to bar, to celebrate or to drown their sins in music and tequila. Across this tumultuous plaza, toward the far left corner, is a small and surprisingly quiet dead-end alley that ends in front of an abandoned theater. Walking down the aptly named “Callejón de la Amargura” (Alley of Bitterness), you approach the shattered façade of the playhouse, where a newly made neon sign proclaims with cheeky radiance: “Teatro Santa Cecilia.” Filled with giddy anticipation, unsure of what you’ll find inside, you begin this bizarre and enigmatic experience. Stepping inside, you are welcomed by the immense height of what was once the front lobby but is now just an empty space. A low-pitch rumble fills the otherwise quiet atmosphere — the noise of a generator struggling to light the room. 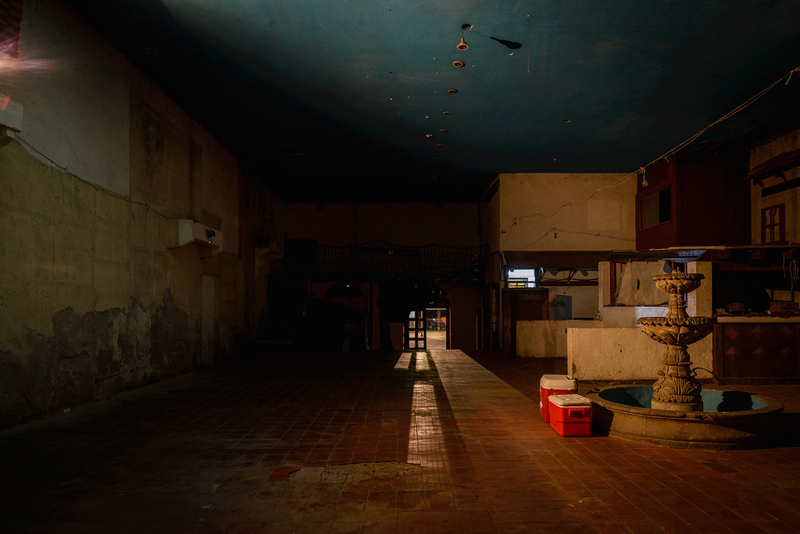 Stumbling along in the faint light across this impressively rundown vestibule, you push past thick dark curtains and enter what feels like another dimension: complete darkness except for the full moon that shines from a video projection towering over center stage. Once your eyes adjust to the lack of light, the theatre reveals its full splendor. The seats are nowhere to be found. In their place, debris is so densely packed that at points it becomes an even surface, perhaps the result of decades of entropy. 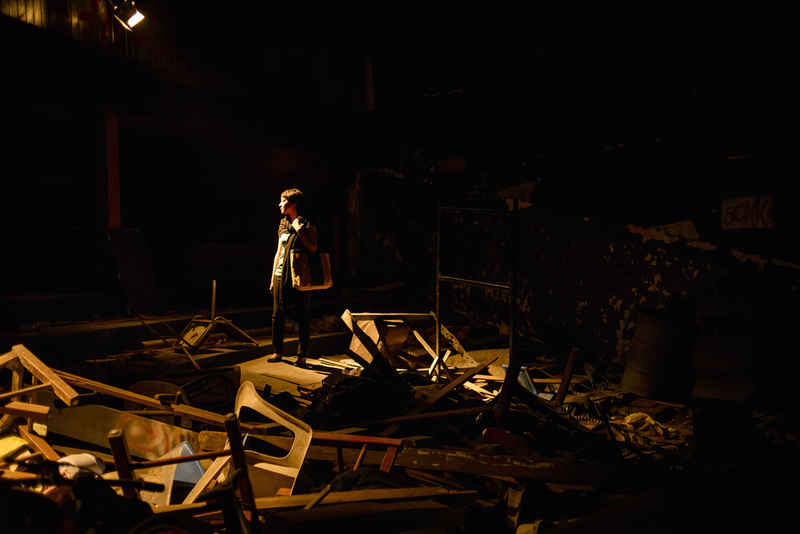 Spotlights shine on broken plastic and wooden chairs lying atop mountains of rubbish bags; yellow tarpaulin and torn-down posters seem to grow from the smashed-up floor. The moonlight from the movie screen reflects on the graffiti-covered walls, the video shifts to the view from a lunar rover driving on the surface of the moon, and a monotonous voice traveling from far away, as if from an interstellar radio, gives out the instructions for a lunar landing. “Altitude, velocity, … twenty feet, fifteen feet forward, … four and a half down, five and a half down …”, until the transmission breaks off. Amidst the accumulated dust, a tense tranquility permeates this moonlit scenery, a strangely peaceful atmosphere created by looking at an ocean of discarded objects. Navigating this tide of garbage recalls Stanislaw Lem’s Solaris; very much like the omniscient sea in the novel, this landscape is a living organism that conjures up past lives and better days. Sailing across heaps of detritus, your eyes and mind can’t stand still. Where did all this trash come from? Where did all the seats go? Is this a movie set or an imagined modern-day extrapolation of the lunar surface? Was this auditorium carefully crafted or are we being pointed at something that already existed? Your mind wrestles with these questions under the full moon shining from the stage. You look up and find the partially destroyed roof actually opens to the sky, letting in the cold air and welcoming whatever the night might bring next.